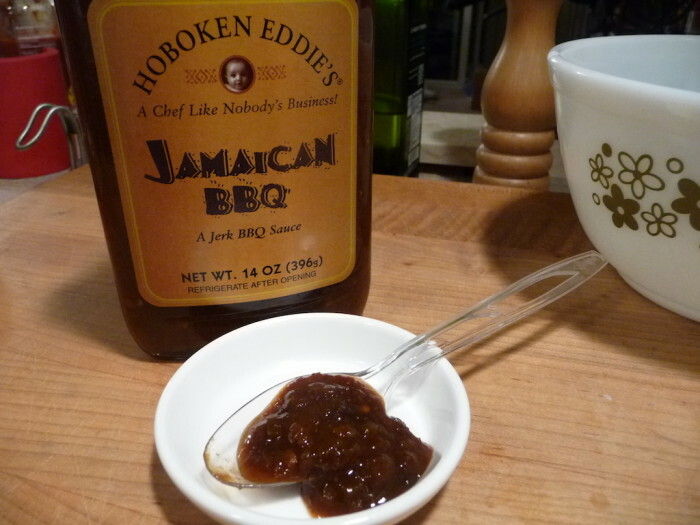 Day 6 of our Week of Wings features a Caribbean Jerk BBQ sauce from Hoboken Eddies. 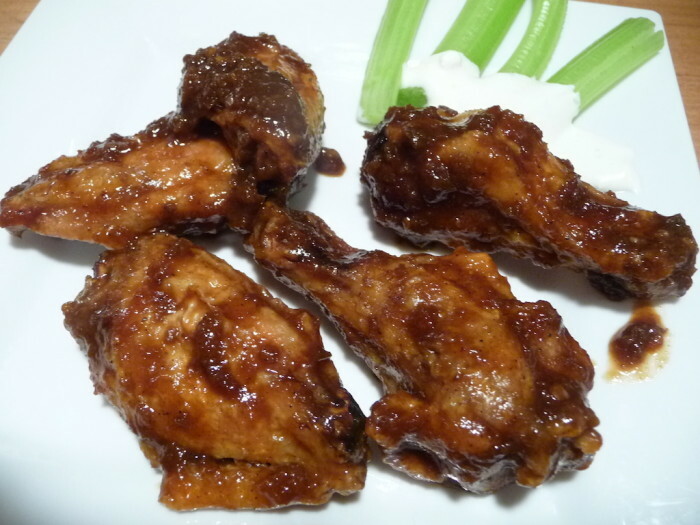 Week of Wings 5 – Day 6. 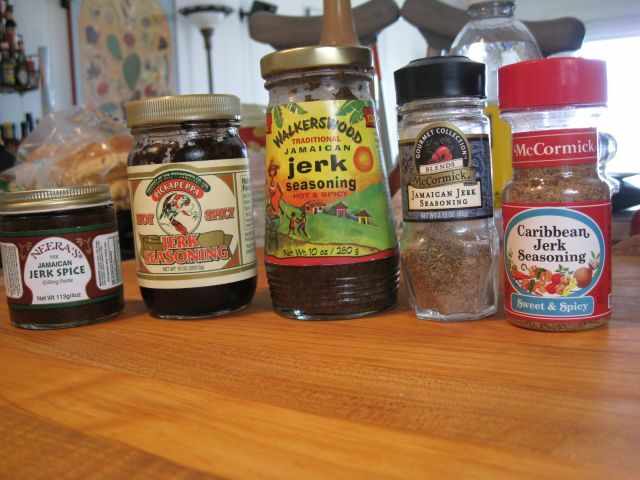 I love jerk seasonings and jerk sauces, and so I usually include them in our Week of Wings series. This one is a little different in that it’s not your typical jerk sauce. 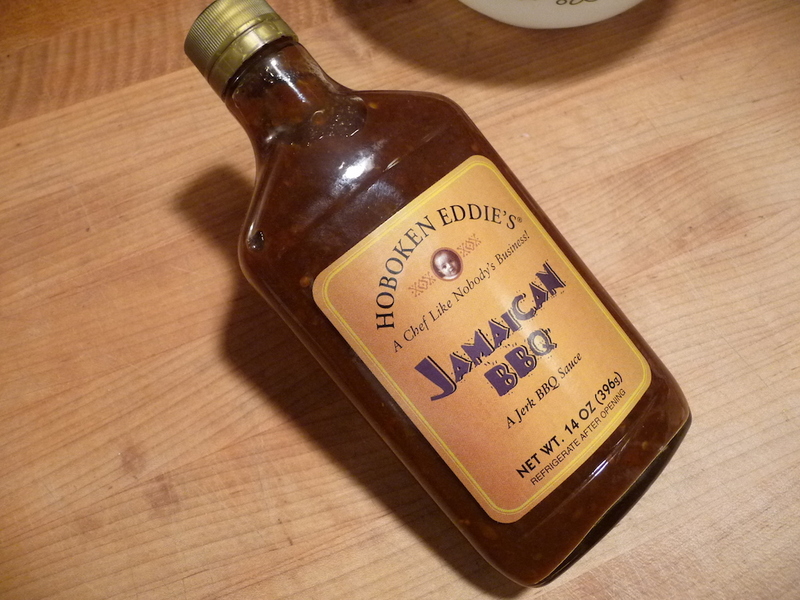 Hoboken Eddie’s Jamaican Jerk BBQ is more of a thick, barbecue style sauce with jerk overtones. It made some hot, spicy wings. Preparation: Deep fried. We did our usual 3 step cook – baked at 350º for 40 minutes (turning once half-way through), deep fried at 350 – 375º for 2 – 3 minutes, then tossed in the sauce. See our Wings 101 post for more info. Ingredients: relish, apricot jam, jalapeño peppers, ketchup, hot sauce, vinegar, brown sugar, molasses, chopped cherry peppers, worcestershire sauce, tomato paste, ginger, water, liquid smoke, allspice, cinnamon, curry powder, chives. 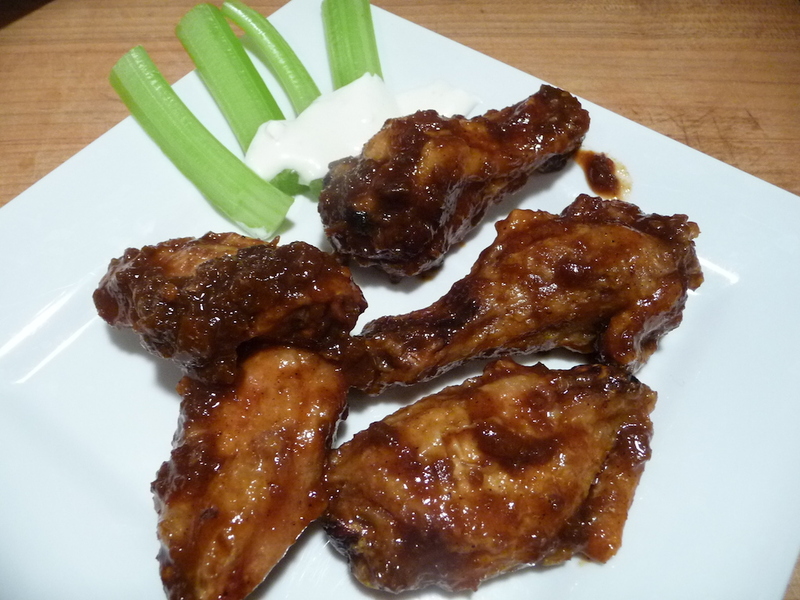 Texture and Appearance: Dark reddish brown in color, this jerk bbq sauce is very thick and super chunky, thanks to the first ingredient of relish. It coated our wings well, and the bits of relish and peppers added some nice texture. Beautiful. Taste straight up: First up, you know you’re eating a smoky tomatoey BBQ sauce. A fruity sweetness and spice are next, with some considerable heat coming in last. It’s a pleasant taste overall, and the tiny chunks add to the mouth feel. Sweet and spicy. Taste on wings: Sweet and flavorful, this sauce is hard to characterize. The Jamaican Jerk BBQ influence is there, but in a light-weight amount. Ginger, cinnamon and garlic play a big role in that. Marilyn tasted a heavy roasted veggies profile that she found delicious. Also, she is not a fan of jerk sauces, but thoroughly enjoyed this sauce on our wings, and looks forward to trying it on some ribs. I find it very fruity, without being too sweet – a nice complex balance of flavors. I think of it as “Americanized Jerk”, as it really is a BBQ sauce first. And the smokiness was muted in the end. Very unique. Heat Level: – I know we’re only talking about jalapeños and cherry peppers here, but this sauce brings on a good amount of heat. Our lips were tingling, and the burn fills the mouth and throat. It’s not exactly short-lived either. Warm. Overall rating: – Our most unusual wings of the series this week. Jamaican Jerk BBQ Sauce from Hoboken Eddie’s is a fantastic sauce with so many possibilities, from burgers, to ribs, to pork and chicken. I don’t want to forget to mention the awesome 14 ounce “flask” bottle is a hefty and attractive package. Disclaimer: We received this product courtesy of the manufacturer for review. Chef Edmund Patrick “Hoboken Eddie” McCarthy starts with the highest quality ingredients and then mixes them with a secret array of herbs and spices to conjure-up his tastebud tantalizing sauces.never thickened with cornstarch or xathum gum,you can taste the difference, There are no animal products, fats, or oils. At last check, Hoboken Eddie has a line-up of 17 different and unique sauces ranging from BBQs to hot sauces; from mustards to chutneys, and some sauces that defy categorization. Visit HobokenEddies.com to check out his awesome line of products. Follow HobokenEddies on Facebook too. We rubbed some chicken thighs with 4 different jerk seasonings to see how they compare, then grilled them to jerk-perfection! We began by rubbing each seasoning on a pair of skinless chicken thighs the night before. The next day, it was time to grill these spicy jerk chicken pieces, and see which we liked best.